Cluster beans vegetable also known as Guwar, Gavar or Guvar bean. The scientific name of cluster beans is Cyamopsis tetragonoloba and belongs to the Leguminosae family. Cluster beans are a highly important leguminous crop of the Kharif season. These are grown our country mainly as green fodder but also for use as green manure, grain and vegetable. It contains numerous minerals namely potassium, Folate, Iron and calcium and vitamins such as vitamin A, B and K and Cluster beans and their seeds have enormous medicinal value packed with numerous health benefits. Cluster beans contain calcium and other minerals which help in strengthening the bones. Phosphorous also present in the cluster beans aids in fortifying the bones and enhances bone health. Cluster beans are loaded with Calcium, Iron, vitamin K and Folic acid. Folic acid which helps to prevent the fetus from numerous birth defects and other pregnancy related health issues and vitamin K helps with better fetal development. 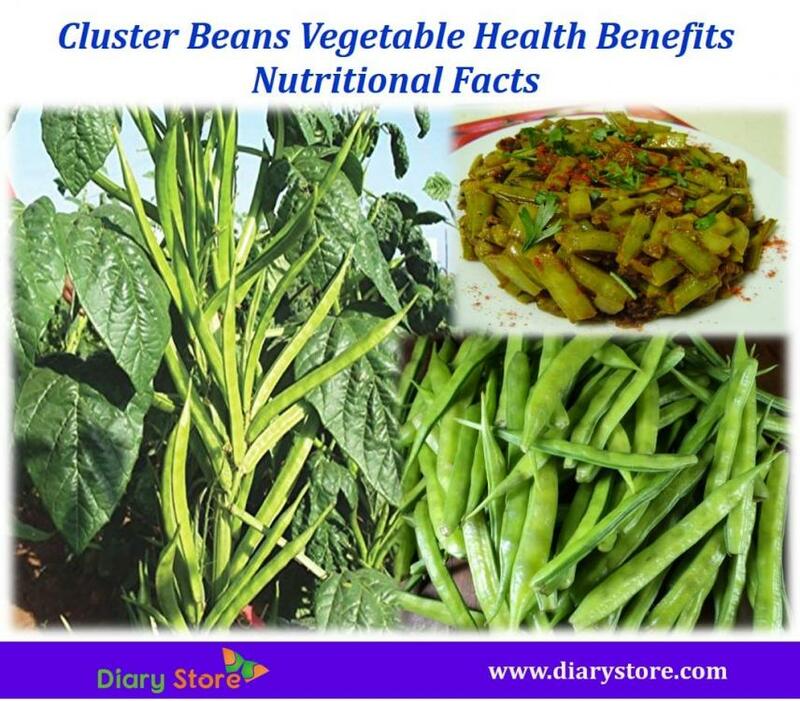 Cluster beans contain dietary fiber, folate and potassium which help lowering the blood levels of bad cholesterol in the body and also protects the heart from various cardiovascular complications. Cluster beans have the hypoglycemic properties which help in relieve the nerves and also reduce tension and anxiety and calm the person mentally. Cluster beans have the hypolipidemic and hypoglycemic properties which make them the best natural aid for people suffering from hypertension. Heart disease and diabetes increase the risk of hypertension; hypolipidemic and hypoglycemic compounds play a key role in controlling the blood pressure levels. Cluster beans are rich in iron it increases hemoglobin production, which helps in proper blood supply in the body and Phytochemicals are also present in the cluster beans which improves blood circulation. Glyconutrients are present in the cluster beans that help in controlling blood sugar levels in the body. Cluster beans have a low glycemic index it does not allow the blood sugar levels rise and fall rapidly. So add cluster beans in your diet and maintain a perfect blood sugar level. 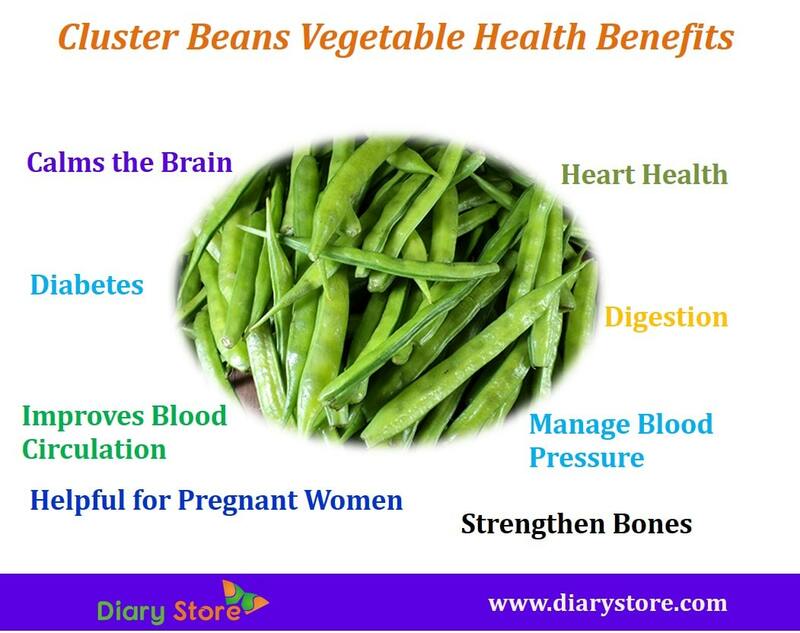 Cluster beans vegetable loaded with fiber which keeps digestion well and remove unwanted toxins and prevents digest related problems.